Data-driven design is an exciting area of work that I explored in Junior studio with Kyuha Shin as my instructor. 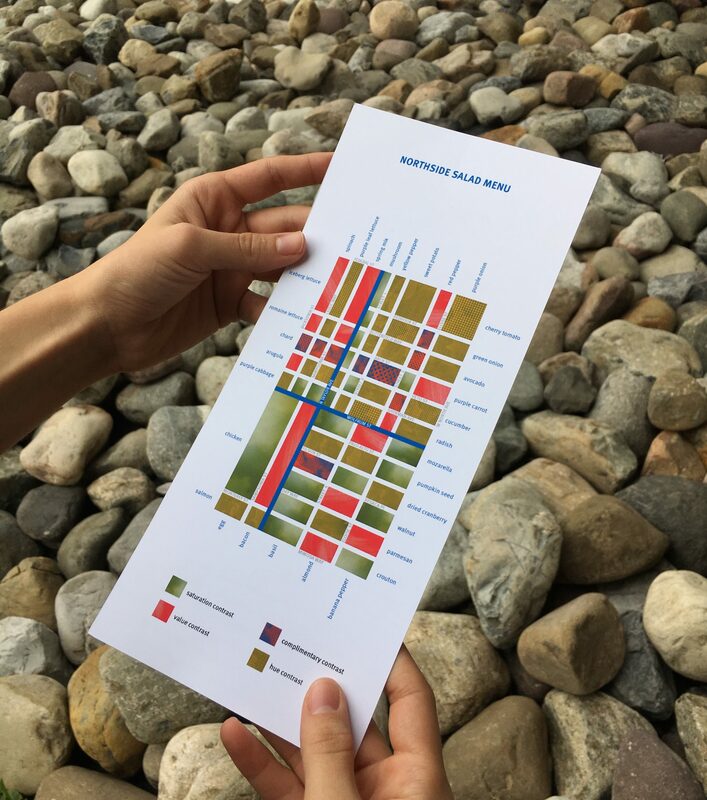 For this project, Julia Wong (a very talented classmate and dear friend), and I designed three sequential deliverables that lead to a deeper understanding of the colorful, vibrant neighborhood in Pittsburgh, The Northside. 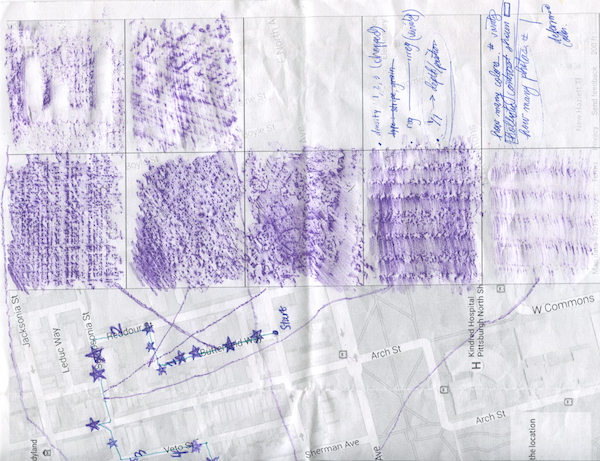 After visiting the Northside several times, grabbing lunch at a local, hole-in-the-wall BBQ place, drinking coffee at a neighborhood coffee shop, and exploring the area by foot, we developed a theory by which to collect and understand place-based data in this neighborhood. We called this process Decoding Place. As we considered the way people make sense of place, it became clear that there are two parallel pictures in play here. We described the first as “Environment’s Raw Data,” which is made up by all sorts of objective data. 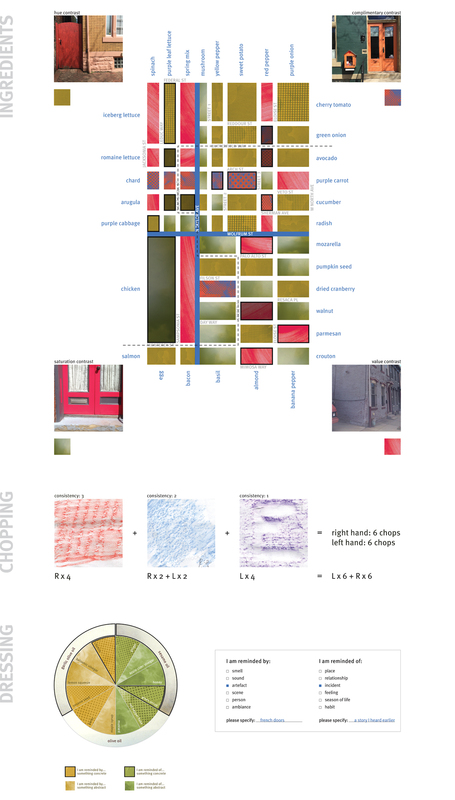 The second picture is made up by human understanding and perception of environments. But there’s a catch.The first picture of “objective” data is, in fact, perpetually modified by human touch and presence. Evidently the human touch acting on the first picture, becomes part of the data interpreted within the second picture. We utilized a two-by-two model in order to capture methods of perceiving data. In this case the model contains two axis: literal to abstract, and thinking to sensing. The resulting four quadrants extend four ways of perception. 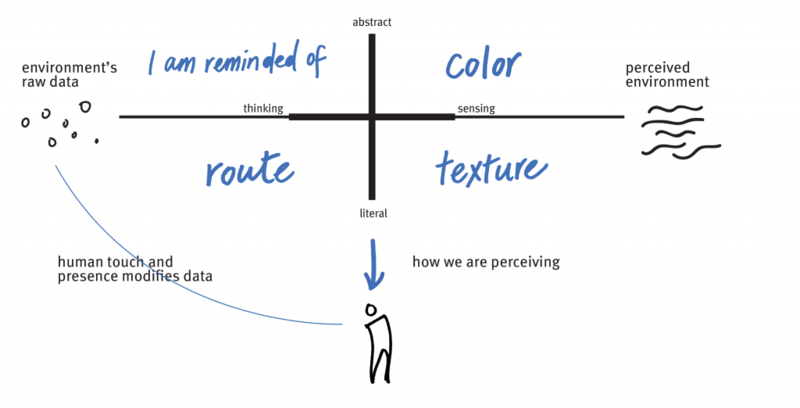 Considering the types of data that speak loudly about place, we categorized four unique kinds of content into the model below. an amalgamation of multiple human perceptions in that our individual impressions of Northside are affected by the imprint of the community as a whole. Thus, adding and subtracting an individual’s impression will alter the holistic picture. As a result, we asked two other friends to participate in the collection process so that we might gain a richer overall understanding of the neighborhood. The four items we observed in Northside were: color contrasts evident in the area (hue/saturation/complimentary/value), texture prints of surfaces seen on our walk, the actual route each participant took while exploring, and an abstract data we coined “I am reminded of” which was anything participants noted as reminding them of past memories, people, or feelings. When the exploration and discovery process came to an end, we were still left with an unknown deliverable. What product, image, service, experience, etc. would best reveal Northside’s unique attributes through the data we collected? It was at this point that Julia and I came to a very important realization. If data is to actually drive or “make” a product, it cannot simply be translated from one identity to another. The collected information must actually be transformed into conditions that direct and create something new. Extending the idea of an environment’s “flavor,” we explored the notion of a data-driven Northside Salad as our final deliverable. Thus, it is the salad’s menu that acts as an algorithm whose ingredients and methods of serving are determined by Julia, Rae, Christine and Jessie’s perceived color, texture, route, and “I am reminded of” data. 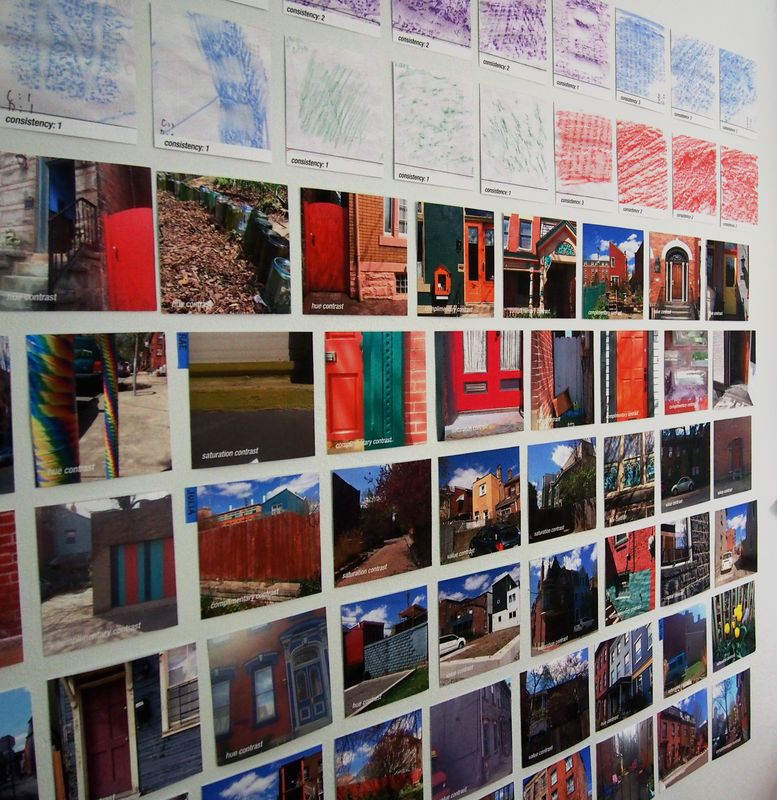 This wall of all the images and texture prints made in Northside were arranged for reference at the salad party.